Bed And Breakfast6458 sq. ft. The farm is located in the city center, quiet location from which you can enjoy a splendid panoramic view. Masseria Asteri Resort "is a prestigious dwelling to conjure up the thrill of the past, a lovely and refined building. Travelers who will stay with us will be able to admire the local handicrafts, follow cultural events and exhibitions, wander among the sounds and scents of the many gardens in the area. A short distance from our residence guests will find several monuments and famous places for sports facilities and gyms to take care of your body. Our residence is the perfect location for families who like to travel and want to feel at home, for conferences and business trips, for a romantic getaway to meet and rediscover, for those in search of relaxation and rest. On request, you can take part in excursions (trekking) to admire the beauty of our landscape. Our air-conditioned rooms are equipped with hairdryer, internet access, a children's bed (on request), TV, minibar. A triple room French bed and king size double bed. -Junior suite la Cucina: double bedroom with two beds. Completely renovated, refined and cared for in every detail. It consists of two rooms, both with direct access to the inner courtyard of the farm. It has five beds: a double bed, a sofa bed and an additional cot upon request. - Pollaio Junior Suite this room was born where there was the ancient henhouse of the farm. Characteristic is the vault of the barrel type that rests on tufa walls in which are housed the ancient "stipi" (old deposits of tools) entirely excavated by hand. Conditioner, free minibar, wi-fi LCD TV. -Suite the stable completely renovated, refined and cared for in every detail. It consists of two rooms, both with direct access to the inner courtyard of the farm. It has a maximum of five beds: a double bed, a sofa bed and an additional bed upon request. Very bright and welcoming, it has direct access to the internal courtyard of the farm; in addition to serving guests there is also a convenient kitchenette. It has three beds: a double bed and an additional bed, ideal for groups of three or four people. N. B. contacts the structure to know the promotions reserved to Ns. guests. * Services provided linen change and cleaning rooms, internet wi fi, Italian breakfast for guests, free minibar. Wide open space with garden with typical Mediterranean scrubland plants and solarium corner. 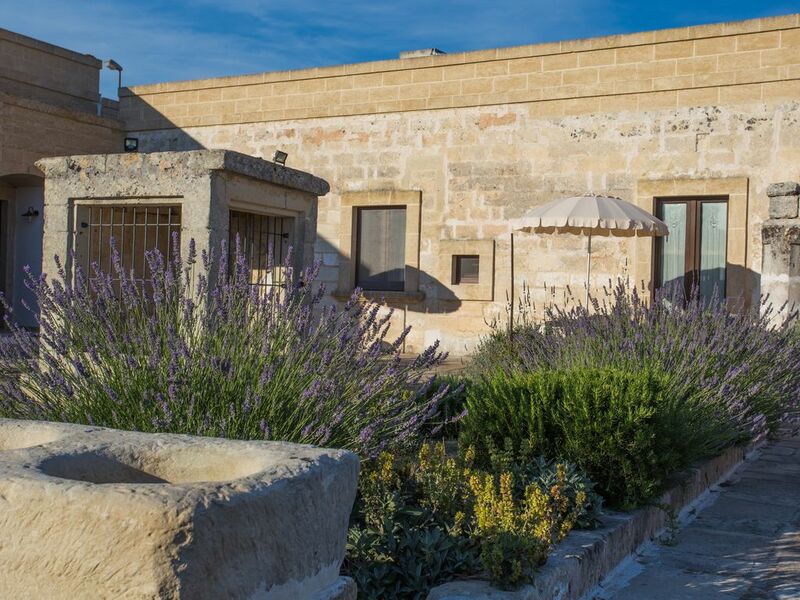 Masseria Asteri the luxury of simplicity. For any info do not hesitate to contact us thanks. fully restored beautiful 1800 location consists of No. 5 independent apartments with private bathrooms in each room, each room has a TV mini bar for free for guests. Large open space with garden and maquis. for years I have been in tourist locations, I like to socialize to meet new people and make new friends. Care and attention to the guests is always high but never pressing, we like every guest to be comfortable and spend unforgettable holidays. The bathroom consists of: shower with overhead shower, sink and bidet and each room has its own bathroom. Bellissima struttura restaurata alla perfezione e con cura nei dettagli.